Water ice on Mars is not currently stable in the near-equatorial regions of the planet, yet features hypothesized to require the presence of volatiles in the subsurface to form have been well-known for decades. Layered-ejecta craters (once termed ‘fluidized-ejecta craters’ and ‘rampart craters’) have distinct patterns of their ejecta produced during the impact event. These ejecta shapes appear to result from an impact into materials mixed with subsurface ice. Kirchoff and Grimm [writing in the Journal of Geophysical Research] investigate a subset of these craters and find that layered-ejecta craters near the equator of Mars have formed in each of the planet’s major time epochs, implying ice has even been present geologically recently. However, the authors also find that these layered-ejecta craters are interspersed with craters with more typical ejecta patterns not associated with subsurface ice indicating that the preservation of such ice has been heterogeneous in both location and time. 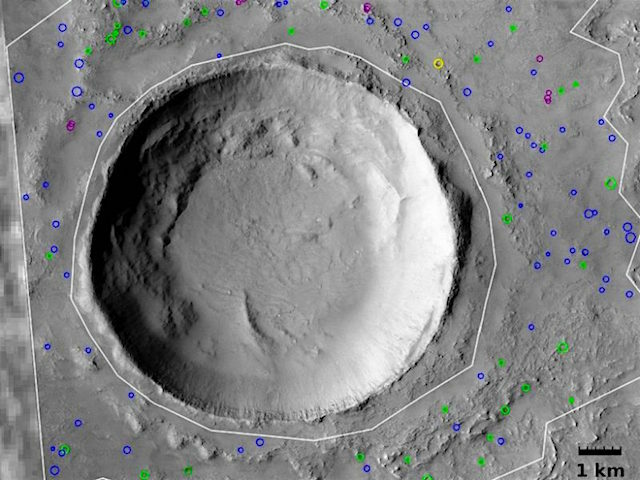 This entry was posted in Reports and tagged ground ice, layered ejecta craters, rampart craters, rampart ejecta. Bookmark the permalink.